a separatist phase (1960 to the present), where the self-designation of fundamentalism is restricted to Protestants who remove themselves from mainstream American culture and religion. There is (always) more to say, but again, I think this is probably the best place to start. I’ve reprinted his whole essay below (with the kind permission of Trinity Journal), sans the footnotes. The term fundamentalism has become the most elusive term on the American (and world) religious scene. To delve into the meaning of fundamentalism is to immerse oneself in a cornucopia of scholarly (and non-scholarly) books and articles, each articulating a somewhat different definition. Today the label fundamentalist is not only applied to old-fashioned, Bible believing, anti-modernist Protestants but also to conservative Muslims, Jews, Catholics, Buddhists, and Sikhs. Even within Protestant circles, the debate over who is a fundamentalist and who is not continues to rage. For example, are self-styled evangelicals (those associated with Christianity Today, Trinity Evangelical Divinity School, or Wheaton College) deserving of the label fundamentalist, or does that moniker apply only to the most conservative of Protestant institutions, with strict moral codes and commitments to ecclesiastical separation, such as Bob Jones University? Those attempting to penetrate the dense forest of such twentieth-century religious terminology are bound to encounter a few thorns along the way. This paper will attempt to make some sense of American Protestant fundamentalism by chronicling its subtle changes through the course of the twentieth century. I will argue that Protestant fundamentalism in America can be understood best by viewing the movement through four distinct periods, or “phases”: (1) an “irenic phase,” which runs from approximately 1893–1919 and serves as a harbinger to fundamentalism “proper”; (2) a “militant phase,” that runs from 1920–1936 and which encompasses the now famous “fundamentalist-modernist controversies”; (3) a “divisive phase” from 1941–1960, associated with the intramural fragmentation of fundamentalism into “evangelical” and “separatist” factions; and (4) a “separatist phase” from 1960 to the present, in which the term fundamentalism is applied to those Protestants who choose to remove themselves from the mainstream of American culture and religion. The story of American fundamentalism is the story of those nineteenth-century American mainstream Protestants and their heirs who arose to defend traditional evangelical doctrine in light of cultural, intellectual, and ecclesiastical change in American society and religion. While fundamentalists always maintained a certain continuity in their core doctrinal convictions, they responded to attacks on this heritage with somewhat different approaches. Twentieth-century fundamentalism is thus characterized by both continuity and change. Such an approach runs counter to those of historians and religious observers who view the movement as theologically and ecclesiastically static. This essay will focus on how fundamentalists have changed during the century. Its purpose is to help students of fundamentalism make sense of this movement in its different manifestations through an interpretation that grounds this religious phenomenon in twentieth-century religious history rather than in sociological categories. These phases of fundamentalism cannot be examined without a grasp of recent historiography in the field. Ernest Sandeen’s statement that “the fate of Fundamentalism in historiography has been worse than its lot in history” no longer holds true. Fundamentalist historiography has blossomed since Sandeen’s 1970 work and George Marsden’s Fundamentalism and American Culture, which appeared in 1980. The work of historians in twentieth-century Protestant fundamentalism provides the backbone to such a “four-phase” approach. At the core, this essay is an attempt to synthesize fundamentalist historiography into a helpful package that sheds further light not only on the historiography itself but also on the changing facade of twentieth-century fundamentalism as a whole. It does not claim to be a definitive or innovative study of American fundamentalism, but rather a new approach to material that has been thoroughly hashed and re-hashed by historians over the past two decades. Its scope is deliberately broad, covering a century of fundamentalist history in a sweeping, survey-like fashion with the hope of illustrating some of the movement’s ideological shifts. Such an approach to American fundamentalism must be guarded against certain methodological problems. First is the problem of labeling. The label fundamentalism has been used by scholars, the press, and other religious pundits to describe a vast array of religious organizations, denominations, and sects. Furthermore, many twentieth-century conservative Protestants disdain this label because of its negative connotations, preferring instead to be called “conservative,” “neo-evangelical,” “evangelical,” or simply “Christian.” This paper will let the fundamentalists speak for themselves about the nature of their movement in a given time period. The four “phases” correspond with the way self-proclaimed fundamentalists understood their uniqueness as members of the religious faction that bore that name. I will thus not impose the label fundamentalism on those historical characters, institutions, and movements that chose not to be associated with the term. Shrouding a historical movement with the current socio-religious terminology of the historian makes for bad history. The second methodological problem centers around the precise dating of these four phases. Restricting open-ended social and intellectual movements to neatly prepared historical packages confined by set dates is the historian’s greatest sin. Obviously the ideology behind each of these phases does not cease to exist at the terminal date. For example, the element of “militancy” in fundamentalism extends well beyond 1936. There were also separatist fundamentalists before the “fourth phase” of fundamentalism, which this paper argues got underway in 1960. Furthermore, the ministries of fundamentalists like William Bell Riley, Carl McIntire, John R. Rice, R. A. Torrey and C. I. Scofield transcend any one phase. The dates assigned to these four “phases” are merely guideposts that symbolize a general change in the ideological convictions of those who called themselves fundamentalists. Thus for the sake of clarity and of providing a clear picture of fundamentalism to future students of the movement, I have chosen to sin boldly. Gradually late nineteenth-century denominational conservatives began to take necessary precautions against the rising tide of modernism. The Presbyterian Church-USA tightened its conservative theological stronghold over its churches by establishing a five-point doctrinal creed to measure the orthodoxy of ministerial candidates. Arno C. Gabalien separated from the Methodist Church in 1899 and started an anti- modernist journal, Our Hope, to fight the inroads of liberalism. As early as 1917, Riley expressed concern about modernism in the Northern Baptist church in his work, The Menace of Modernism. However, this type of reaction was not the norm among theological conservatives in this “first phase.” For the most part, prior to World War I, evangelical conservatives were quite moderate in their attitude toward theological liberalism. If one defines twentieth-century fundamentalism—as Marsden does—in terms of “anti-modernism,” it is fair to say that pre-World War I fundamentalism should be understood more in the light of nineteenth-century evangelicalism than twentieth-century fundamentalism. Despite the growing theological tension, most church leaders in this phase were committed to preserving denominational unity. It is thus anachronistic to label World War I conservatives with the strongly anti-modernist label fundamentalist (assuming Marsden’s definition). Not only was there no such anti-modernist attitude yet dominant, but the term fundamentalist had not yet even been publicly coined. 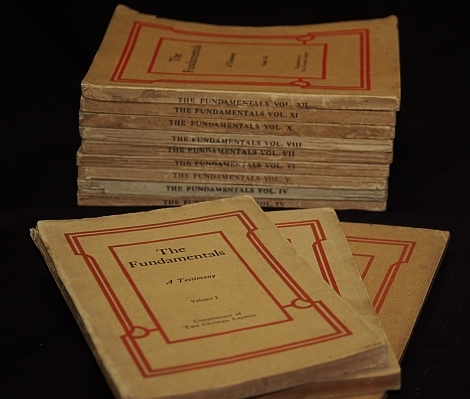 The Fundamentals: A Testimony to the Truth, first published in 1910, was a clear example of the irenic, yet concerned spirit of conservatives toward theological modernity. The Fundamentals included twelve volumes of theological essays devoted to providing a “testimony” to what the authors believed to be the fundamental principles of evangelical faith. Marsden has argued that, at the time of its publication, The Fundamentals represented the consensus of religious thought in America. Like the entire period from 1893–1919, The Fundamentals are better understood in the context of irenic nineteenth-century evangelicalism than twentieth-century “militant” fundamentalism. The Fundamentals set forth evangelical doctrine in a straightforward, non-bellicose manner. Contributors to the project represented a wide range of denominational affiliations. The selection and content of the articles displays the moderate tone of the volumes. No articles were designed as specific attacks on modernist tendencies, nor did any article focus on the issue of ecclesiastical separation (the view that Scripture demands true believers to “separate” from a denomination influenced by modernism or modernist leadership). Several essays painted higher criticism in a positive light, while others supported some form of biological evolution. Nothing of the bitterness and cantankerousness of the fundamentalism of the following decade is seen here. Many of the articles would probably have been looked upon with a certain suspicion by more hardened fundamentalist power brokers, such as J. Frank Norris or Riley. Thus the first phase of American fundamentalism cannot actually be labeled fundamentalism at all. It can be explained simply as the attempt of nineteenth-century evangelicals to formulate a plan for addressing the rising tide of theological modernism that was influencing their denominations. However, the irenic spirit of theological conservatives should not be mistaken for a cavalier attitude toward modernism. While conservatives had not yet manned their battle stations for full-scale war over the future of the denominations, neither were they unaware of the ever-growing presence of the enemy. In reality, many future fundamentalists were using this era to devise their battle plans for the coming decades. Marsden reminds us that the enemy in the war was Germany, the mecca of theological liberalism and biblical higher criticism. Many conservative evangelicals began to associate the destructive character of the German war machine with the destructive nature of liberal theology upon traditional orthodoxy. The result was a belligerent mentality that would spread from the military campaigns of Europe to the ecclesiastical confrontations of the 1920s. America was engaged in a world war, and the attitude and vocabulary associated with that war was transferred to the churches. We here and now move that a new word be adopted to describe the men among us who insist that the landmarks shall not be removed. “Conservatives” is too closely allied with reactionary forces in all walks of life. “Premillennialists” is too closely allied with a single doctrine and not sufficiently inclusive. “Landmarks” has a historical disadvantage and connotes a particular group of radical conservatives. We suggest that those who still cling to the great fundamentals and who mean to do battle royal for the great fundamentals shall be called “Fundamentalists.” By that name the editor of the Watchman-Examiner is willing to be called. It will be understood therefore when he uses the word it will be in compliment and not in disparagement. The term fundamentalism thus made its appearance on the American scene in 1920 and was associated with anti-modernist forces in American mainline denominations. With the introduction of the term fundamentalist into this study, we must stop and examine some of the various definitions or interpretive schemes that historians have applied to the label. Perhaps Marsden’s off- the-cuff definition, “a fundamentalist is an evangelical who is angry about something,” best sums up the way the word was used in this phase. A fundamentalist was one who not only adhered to an evangelical body of doctrine but, as Laws put it, did “battle royal” for this body of doctrine. The distinguishing characteristic that made fundamentalism a unique subset of American evangelicalism in the 1920s was not doctrine but the attitude toward the defense of such doctrine. Other scholars, such as Sandeen, Joel Carpenter, and Virginia Brereton, locate the core of fundamentalism in the independent, non-denominationalists who were dispensational-premillennialists in theological conviction and usually associated with conservative Bible institutes. Carpenter understands fundamentalism as a growing network of independent Bible schools, missions agencies, conferences, and magazines, most of which were founded by pastors and people once associated with Dwight L. Moody. Sandeen takes a similar approach, describing the entire movement in terms of the doctrinal distinctives of the dispensational branch. And Brereton emphasizes the primarily dispensationalist Bible Colleges as the crystallizing point of this phase of fundamentalism. To be sure, the non-denominationalists associated with educational institutions such as Moody Bible Institute played a key role in this phase of fundamentalism. But using this coalition as the primary grid for interpreting the entire movement is reductionistic. Denominationalists, particularly Presbyterians and Northern Baptists, did not subscribe to the hardline premillennial dispensational stance of the non-denominational/independent group, yet they often displayed anti-modernist militancy to a much greater extent than the non-denominational branch. Like eschatology, ecclesiastical separation—the belief that the only approach to modernism was to separate from the denomination and form a new church—is another concept that can lead to confusion if it is made the touchstone of the second phase of fundamentalism. Anti-modernism should not be confused with ecclesiastical separation. Throughout much of the 1920s, the battles were fought within mainline denominations. Neither party was willing to surrender control of the denomination to the opposing forces. Even the most militant of all anti-modernist organizations, the Baptist Bible Union, had very few members who had left their denomination. Several denominational anti-modernist leaders remained in the denominations when their peers had decided to separate. This was the case with J. C. Massee in the Northern Baptist Convention and Clarence Macartney in the Presbyterian Church-U.S.A. Even Moody Monthly editor and fundamentalist leader James M. Gray advised a reader not to separate from her modernist bent congregation. Certainly many anti-modernists left to form new denominations—e.g. Robert T. Ketcham and the General Association of Regular Baptists (founded in 1932 by those who left the Northern Baptist convention). But others remained in the mainline churches to continue the battle. Thus, while separation did exist in this phase, it was not the norm. This phase (which ends with Machen’s removal from the Presbyterian Church-U.S.A. for violating his ordination vows by opposing the modernist leadership of the church) may be classified as one of the most pivotal periods in American religious history. Modernism had gained control of the denominational hierarchy and theological seminaries of the Northern Baptist and Presbyterian U.S.A. churches. Some conservatives had been stripped of any ecclesiastical influence they once had. It was also the era of the now famous Scopes Trial, where fundamentalist representative William Jennings Bryan was publicly embarrassed by the famous criminal defense attorney Clarence Darrow in the court battle over biological evolution. Fundamentalist attempts to brave the storm of massive cultural and intellectual change in 1920s America proved unsuccessful. As Carpenter has shown, fundamentalists would spend the 1930s “sheltered” in the wake of this storm. Yet the decades of the 1940s and 1950s served as a pivotal time for the formation of new platforms and organizations for fundamentalism. Fundamentalists emerged in the middle decades of this century with a new vitality to exact an impact once again on the American religious scene. Carpenter has pointed to fundamentalist institutions and agencies that had prospered throughout the thirties as the nucleus for this national organization. As anti-modernists of the “second phase” of fundamentalism approached the 1940s, two distinct theories of national, interdenominational re-organization developed. McIntire and Ketcham, leaders who separated from the Presbyterian and Baptist Churches respectively, organized the American Council of Christian Churches (A.C.C.C.) in September of 1941 for the purpose of continuing the anti-modernist campaign of the “second phase.” Other fundamentalists realized that the struggles of the “second phase” had marred the name fundamentalism forever and that any organizational unity among religious conservatives in the future would have to be based on a more open-minded “positive” approach toward modernism. This group was responsible for the founding of the National Association of Evangelicals (N.A.E.) in April of 1942. If Marsden’s anti-modernist definition is applied to the division within fundamentalism in the 1940s and 1950s, McIntire and Ketcham’s American Council was clearly a fundamentalist organization. But the founding of the National Association of Evangelicals in 1942 creates some semantic confusion for the historian seeking to label these movements. Those in the N.A.E. sought to develop a national organization very similar to the A.C.C.C., only with a wider membership base and a more open attitude toward churches affiliated with the modernist-bent Federal Council of Christian Churches. While not openly apparent at the formation of the association, the agenda of many of the N.A.E. leaders was to separate themselves from the attitude or mood of “fundamentalism,” even going to the point of abandoning the label. A United Evangelical Action (U.E.A.) (the official organ of the N.A.E.) editorial by Harold J. Ockenga clearly designates those associated within the N.A.E. coalition as evangelicals rather than fundamentalists. Another article in the U.E.A. argued that, since the foundation of the N.A.E., the label evangelical had gained new popularity in circles where it was seldom used. This move away from fundamentalism did not happen overnight. The N.A.E. continued to uphold a fundamentalist doctrinal core that still serves as a rallying cry for conservative evangelicals today. Furthermore, the N.A.E. maintained a fundamentalist “mood” throughout much of the 1940s and 1950s. Carpenter has pointed out that a “fundamentalist leaven” dominated the founding of the N.A.E. And Marsden has noted that even Fuller Seminary, founded in 1947 as a neo-evangelical institution, would still continue for some time to be viewed as fundamentalist. N.A.E. members often labeled themselves fundamentalists. Another U.E.A. editorial defined evangelicalism in terms of “putting the old liberalism to rout.” Hardly an expected response from the mouthpiece of a movement attempting to take a positive approach to modernism. Division over how to engage modernism clearly distinguished the two new approaches to national re- organization. McIntire, from the pages of his Christian Beacon, blasted those associated with the N.A.E. for compromising their faith. For McIntire, who had been forced out of the Presbyterian Church-U.S.A. with Machen, anything short of a separatistic and militant stance toward modernism was a compromise that watered down Christian faith. Always one to speak his mind whenever given the opportunity (and even when not given the opportunity), McIntire spent most of his career hurling sensationalistic diatribes at N.A.E. leaders. Meanwhile, another group of independent Baptist revivalists from the South also became frustrated with the N.A.E. for their lack of initiative in city-wide evangelism programs. John R. Rice and Bob Jones, Sr. and Jr., were separatists who had originally joined the N.A.E. because they believed the organization would provide an outlet for them to utilize their evangelistic skills on a national level. When such an opportunity did not emerge, they reverted to a separatist policy and left the N.A.E., although they never did join McIntire’s American Council. The more neo-evangelicalism “upgraded” its theology and ecclesiology, the more heightened the division became with those who sought to maintain a traditional fundamentalist agenda of anti-modernism. In 1955 Henry defined neo-evangelicalism in strictly doctrinal terms, calling a neo-evangelical anyone who was committed to biblical authority, the holiness of God, a revealing God, a creating, supernatural God, man as created in God’s image, the sinfulness of man, the love of God, the death of Christ, the new birth, social action, and the return of Christ. While separatists like McIntire, Jones, and Rice would agree with all these assertions (with the possible exception of social action, which they feared to be linked with the “Social Gospel”), they added a belief in ecclesiastical separation and an aggressive anti-modernism. Separatist disdain reached its zenith in 1957 when Billy Graham, once strongly supported by separatists and non-separatists alike, did not openly oppose modernism in his New York City crusade. Rice removed Graham from the cooperating editorial board of his Sword of the Lord newspaper, and fundamentalists organized themselves against him. Those fundamentalists who stayed in the apostasy took the name “new evangelicals” and formed the National Association of Evangelicals. . . . The fundamentalist position has always been the same. They maintained the modernists have no right to be in the churches and when they [modernists] took control the fundamentalists established the separatist movement. Jerry Falwell, rooted in the independent Baptist coalition associated with Rice, but moving toward a new national, political agenda that would later alienate him from other Baptist fundamentalists, stated, “I used to like the word ‘evangelical’ but it too has been corrupted. And you cannot let anybody tag you with that name any more because every breed of religious animal hides under that tent today.” Jones Sr. stated, “I’ll tell you what an evangelical is: it’s someone who says to a liberal, ‘I’ll call you a Christian if you call me a scholar.’” Finally, Curtis Hutson, present editor of the Sword of the Lord, a paper founded by Rice, warned that a true fundamentalist can no longer be described as both evangelical and fundamentalist because the broad term evangelical has been adopted by the neo-evangelical, non-separatist coalition. Fourth-phase fundamentalism clearly manifests an anti-evangelical attitude, when the term evangelical is used in the narrow sense of describing former fundamentalists who in the 1940s took a “kinder and gentler” approach toward modernism. It is these self-professed fundamentalists that make up the “fourth phase.” This group is obviously the smallest of all historic twentieth-century factions that have called themselves fundamentalists, but they are also the most vocal, often more verbally bellicose than their second-phase forerunners. Their religious heroes include the most militant factions of the second phase. At least one separatist historian has refused to root the movement in the first, irenic phase of fundamentalism because that coalition was not militant enough. This faithful fundamentalist remnant has found seclusion from the world through ecclesiastical empires formed around charismatic leaders. These empires are usually informed by a strict adherence to ecclesiastical separation. What emerges from such ecclesiastical commitments is a unique religious subculture that tends to view certain aspects of American culture as “worldly” and corrupt. Separation for fourth-phase separatist fundamentalism goes hand in hand with the movement’s interpretation of personal holiness. Holiness implies a complete separation from evil, which for fundamentalists includes “worldly amusements” such as card-playing, dancing, attendance at the cinema, and drinking. The only way to maintain a pure “biblical” church is to remain separate from anything that might corrupt it, even if this demands separation from a fellow Christian who does not adhere to such stringent guidelines. Within this fourth phase, a somewhat legalistic form of Christianity develops. Strict regulations become unwritten laws. Any capitulation to popular culture is synonymous with the sin of worldliness. Throughout most of the 1970s suspicion was raised against anyone who wore sideburns, long hair, beards, flair-bottom pants, boots, wire-rimmed glasses, or silk shirts. All members of the empire in good standing were required to submit to behavior codes and regulations of personal grooming and fashion. Graduates of separatist fundamentalist high schools are usually encouraged to attend separatist colleges. Only certain institutions of higher education are safe harbors for young, impressionable eighteen-year-olds. Horror stories abound in the fundamentalist community about young “Johnny” who attended a secular university and later abandoned his faith. Most of these fundamentalist colleges teach traditional subjects blended with a separatist outlook on the world. They are often unaccredited institutions because they refuse to submit themselves to the “worldly” accrediting agencies that force them to compromise their educational convictions. Not all “Christian” colleges are “separatist,” thus making only certain Christian schools safe. Separatist historian George Dollar took it upon himself in the 1970s to provide a list of acceptable and non- acceptable colleges for young separatists to attend. The “safe” list included Bob Jones University, Clearwater Christian College, Maranatha Baptist Bible College, Pillsbury Baptist Bible College, and Shelton College. Dollar warns his readers concerning the dangers of attending neo-evangelical educational strongholds such as Asbury College, Biola University, Moody Bible Institute, Wheaton College, and Columbia Bible College. The most distinctive institutions of American evangelicalism have often been parts of personal empires of successful evangelists. Usually these institutions have been run autocratically or by an oligarchy; in any case, they have typically been regarded virtually as private property. They were designated for a special purpose, which could be defined by the people in immediate command, with no need to answer to ecclesiastical authority. These institutions were thus extraordinarily shaped by the personalities of the individuals who founded and control them. The fundamentalist view of separation, coupled with the personality oriented thrust of these localized empires, has often led to division among today’s fundamentalists. What was once a unified coalition against neo-evangelicalism and Billy Graham has fragmented into fundamentalist civil war. Throughout much of the 1970s and 1980s, fundamentalists took the sword of separation and turned it upon themselves. In the late 1960s McIntire was removed from the leadership of the American Council of Christian Churches by descendants of Ketcham’s General Association of Regular Baptist empire. The issue was McIntire’s disruptive behavior in accusing certain A.C.C.C. members of being “soft” on separation. Rice and Jones Jr. also divided over the issue of separation. Other clashes involved McIntire with Jones; McIntire with Rice; and McIntire, Jones, and the followers of Rice and Ketcham with Falwell. All these ecclesiastical squabbles centered around the degree to which one should practice separation. It is hoped that this paper will shed some new light and understanding on how historians must understand American fundamentalism. While fundamentalists have always been quite averse to new ideas, innovation, or change, it is clear that a certain amount of change has taken place in the specific agenda espoused by those who have fallen under the fundamentalist banner through the course of the century. A nineteenth-century “pre-fundamentalist” did not approach modernism in the same way that a fundamentalist of the 1920s or 1980s did. Ecclesiastical separation was not as important to a 1920s fundamentalist as it is for a 1990s fundamentalist. The neo-evangelical movement’s emergence in the 1940s and 1950s not only divided conservative Protestants, but brought about a clear distinction between those who would continue to carry the fundamentalist banner and those who would adopt the more moderate evangelical stance. Future historians of the movement need to be aware of these subtle differences before making blanket interpretations that describe all twentieth-century fundamentalism with adjectives such as “separatist,” “militant,” or “anti-intellectual.” American fundamentalism is neither static nor monolithic. While a certain amount of continuity exists between the phases, the movement was actually characterized by gradual, but constant change. Understanding American fundamentalism as a broad movement characterized by both continuity and change has implications for three types of religious persona. First, such a methodological treatment of fundamentalism should have some effect on how American religious historians understand the movement. Very few historians of American fundamentalism are aware of the subtle changes that fundamentalism has undergone through this century. Many historians tend to define a fundamentalist by certain doctrinal distinctives such as a belief in biblical inerrancy or dispensational eschatology. To interpret American fundamentalism solely through a doctrinal grid is to miss some of the social and ecclesiastical issues (separation, social concern, etc.) that have shaped the movement. While most fundamentalists and evangelicals have been united on certain creedal convictions, disagreements over minor doctrinal issues and the social and ecclesiastical implications of the Christian faith have historically created a great deal of diversity. Second, such an interpretation of American fundamentalism has implications for religious pundits and observers, whether in the media or the academy, who tend to clump all religious conservatives under the banner of fundamentalism. It is clear that historically not all conservative Protestants desired the fundamentalist label. If religious observers were to examine the history of this popular and often pejorative label, they would find that many of the groups they label as fundamentalist have long traditions of opposing this descriptive religious term. Many such pundits may be surprised to find that only a small percentage of American Protestants use this label to describe themselves because of both the past and present implications surrounding the term. Third, such an interpretation of fundamentalism should have implications for church leaders in American evangelicalism. Pastors, missionaries, educators, and religious leaders of all kinds should be aware that fundamentalists of the separatist variety do exist and have made up an important part of the “born-again” heritage in American culture. Most of their religious convictions stem from historical evangelical concerns such as personal holiness, revivalism, and the authority of Scripture. While there is a tendency to treat fundamentalists as extremists or ecclesiastical outcasts, for the most part they make up a unique part of the American evangelical tradition and should be understood in that light. Were Evangelicals Really Silent about Roe v. Wade?